Video Access allows ClickView Administrators to restrict access to videos for certain groups of users. Administrators are the only users who can restrict access to a video. When you change a video’s access, you are managing who has access to view the video. Editing access levels allows you to select who you restrict video access from. Which videos can I restrict access to? 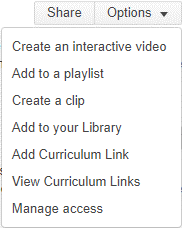 As a ClickView Administrator, you can restrict access to all library videos in ClickView. If the video is pending in the Library Review, you can restrict access to the video by clicking ‘Manage Access’. Who can I restrict video access from? You can restrict video access from all students, selected year groups or all users in the school. Restricting video access for year groups will require the ClickView Administrator to select the year group - the selected year groups will be highlighted in the boxes. When you select a year group, all year groups up to and including will be selected. A notification on the bottom of the window will display the selected year groups. Approves the video and allows access for all users. The full video will be available on ‘Libraries’.